VietNamNet Bridge – The most preeminent overseas Vietnamese technology talents from around the world recently met with Prime Minister Nguyen Xuan Phuc, Minister of Planning and Investment, leaders and technology officers. They visited hi-tech establishments in Vietnam, and shared experiences and views about technology development in Vietnam. More importantly, they suggested solutions on how to develop Vietnam in the long term and what to do in the 4.0 industrial revolution. Most of them were from Silicon Valley. These included Phung Kim Cuong, a senior software engineer at Tesla; Dr Vu Duy Thuc from Stanford University, a well known face among technology startups; Dr Nguyen Duy Lan, who spent nine years working for Microsoft and owns nine technology patents in cybersecurity and Dr Do Binh Minh from NASA (The National Aeronautics and Space Administration). Thuc attended the international Blockchain Week event in early March 2018 in Vietnam, a special session held with Vietnamese blockchain-based developers. 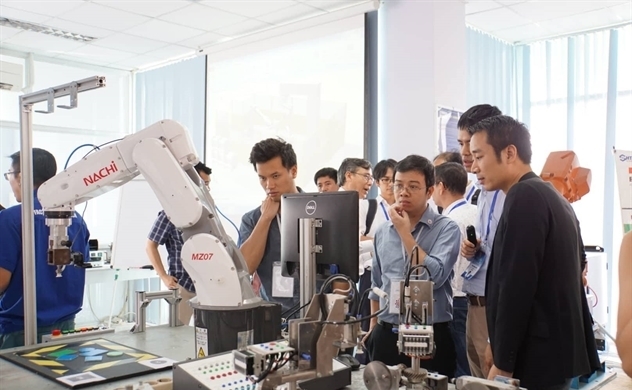 The most preeminent overseas Vietnamese technology talents from around the world recently met with Prime Minister Nguyen Xuan Phuc, Minister of Planning and Investment, leaders and technology officers. There were also many famous names such as Le Viet Quoc from Google Brain, recognized as one of the 35 under-35 young inventors of MIT (Massachusetts Institute of Technology) and Bui Hai Hung from Google Deepmind who are conducting research on AI (artificial intelligence). The flight also brought young Vietnamese who had doctorates from prestigious universities in healthcare, education and agriculture. Of the overseas Vietnamese scientists and researchers, many have decided to return to Vietnam to set up business. Nguyen Duy Lan, for example, has started Veramine, while Cao Anh Tuan with Gene Friend Way can “look” at the genetic code of Vietnamese people to make early diagnoses. “I want to make a contribution to protecting cyberspace in Vietnam,” Lan said. At meetings with ministries’ leaders and local authorities, the technology talents talked about the possibility of cooperating with the municipal authorities in many business fields, from healthcare to agriculture, using the world’s most advanced technologies. VinGroup, established as a real estate developer, has announced its plan to become a technology group. It has inaugurated the Big Data Research Institute where Prof Vu Ha Van from Yale University is the science director. Experts estimate that the 4.0 industrial revolution may help Vietnam’s GDP increase by $8-18 billion a year.